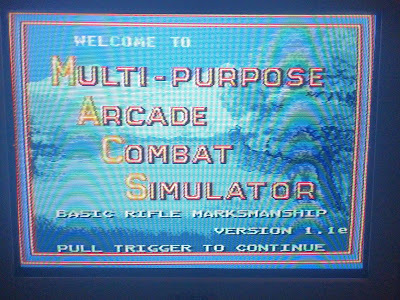 Multi-purpose Arcade Combat Simulator (MACS for short) is a military training video game developed for Super Nintendo. 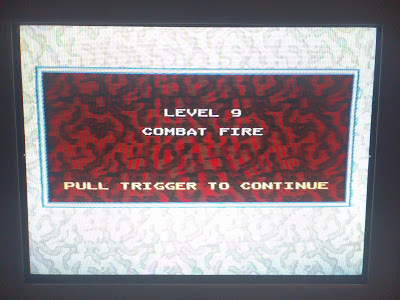 You shoot targets on the screen and the game assesses your abilities and gives you tips for improvement. 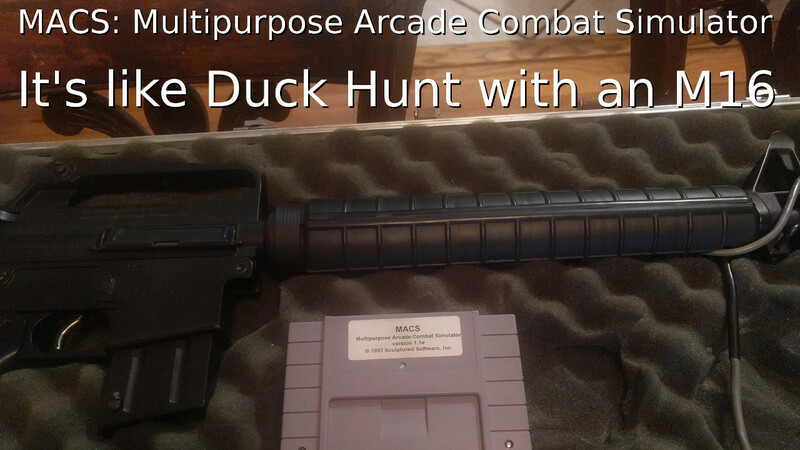 MACS is like duck hunt with a very accurate, full weight replica of an M16 instead of a zapper gun. The United States Armed Forces contracted to have MACS developed specifically for them. It was never released publicly. They used the game at military bases, national guard facilities, and other locations to train troops on proper marksmanship. 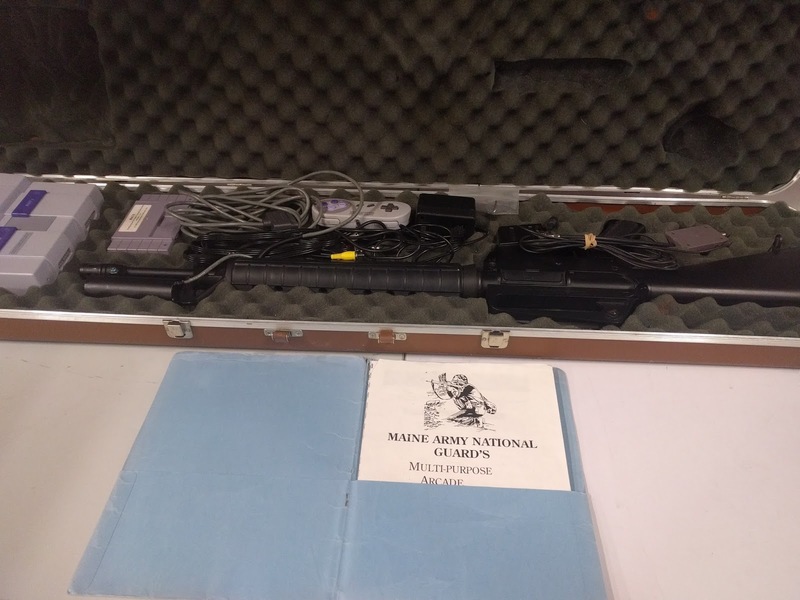 There are reports of soldiers using it at basic training as late as 2002. 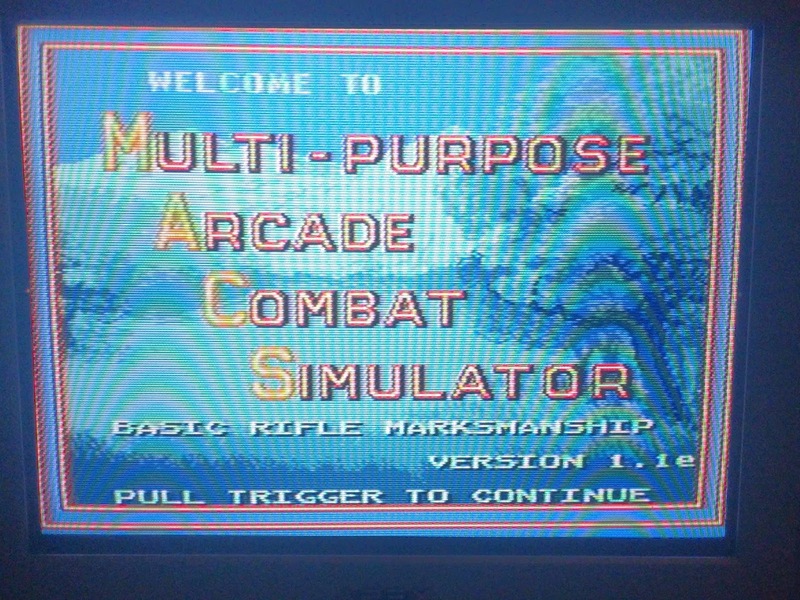 MACS is basically a series of nine tests of shooting ability. If you complete the objective in the test you can move onto the next one (but this can be changed in settings...more on that later). Each test gets progressively harder, moving from a supported position (gun balanced on something) to an unsupported position. From un-timed to timed. Single targets to multiple targets. Etc. 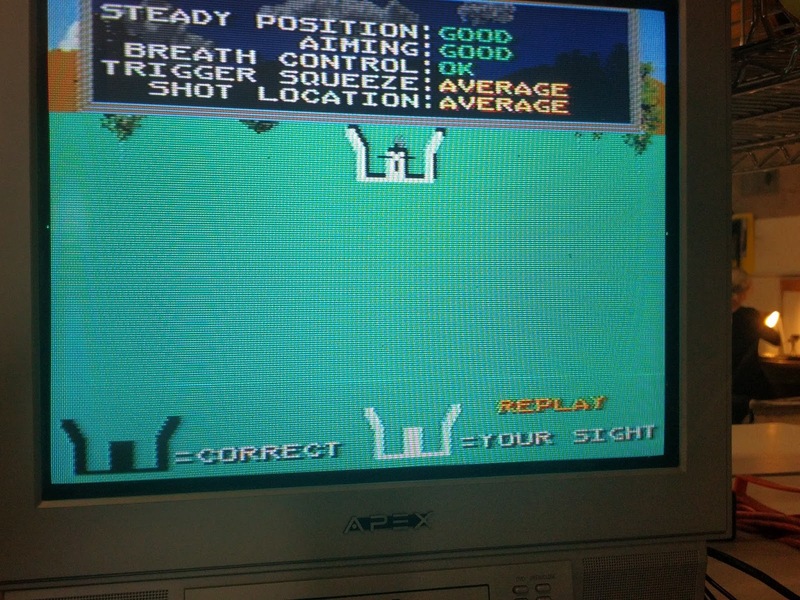 The initial stages give you feedback showing where you were aiming before you shot and where you should be aiming. 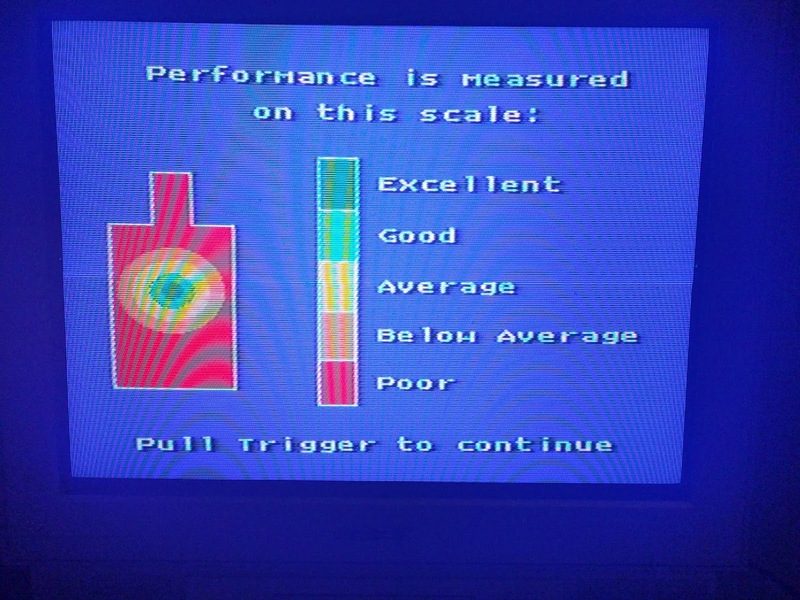 It also tells you where you can improve. 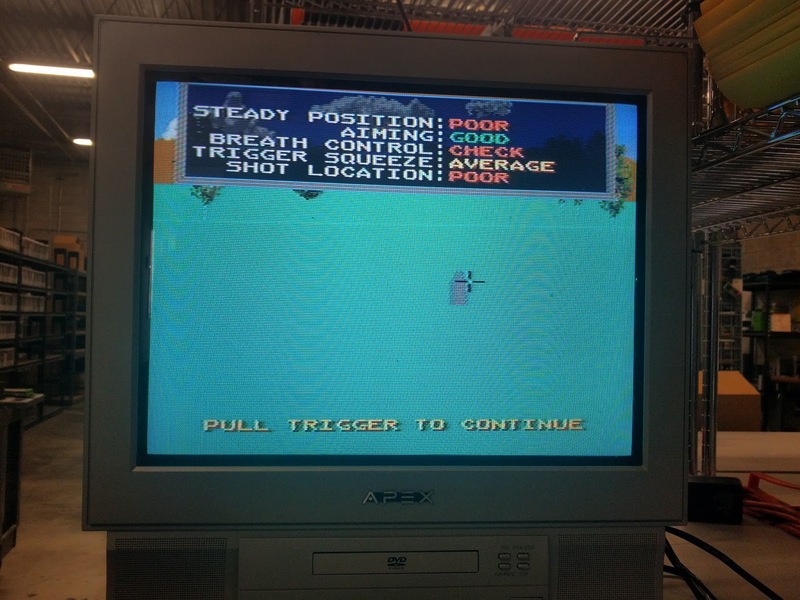 For instance, your breath control is off, you move the gun right as you pull the trigger, or you aren't holding the gun steady. This feedback is actually really helpful and it has improved my aim a lot. 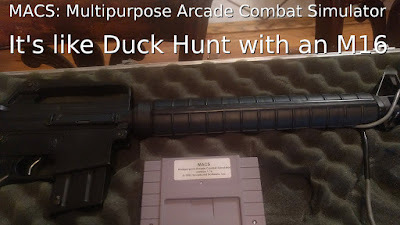 I can see why the military used this game for basic training. The manual gives very precise setup instructions. You are supposed to use a 13" TV and be 7 feet away from the screen. This standardizes the test for all users and makes sure the distances and sizes of objects match up relatively well with reality. I've always used a 20" TV because that is what I have. 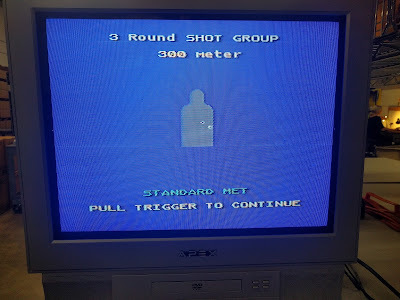 The hardest targets are 300 meters away and they are tough to hit on a 20" TV. The game would be very tough with everything 35% smaller than I'm using. 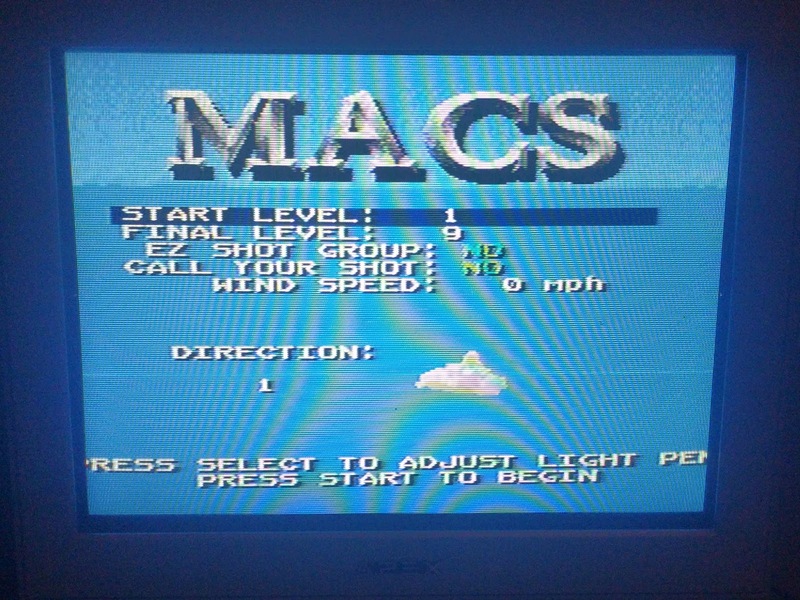 The hardest part of the game is the initial "zero" shot calibration. You need to hit a small target 3 times before you can progress to the actual levels. 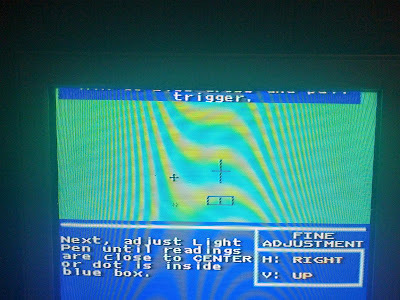 It is difficult because it gives you no indication of where you are shooting and no feedback on where you missed. The game is supposed to teach you how to shoot, but you need to know how to shoot before you can start playing. You only have to do this once per console power-on so I assume the instructors would do this part once per day and soldiers would never see it. 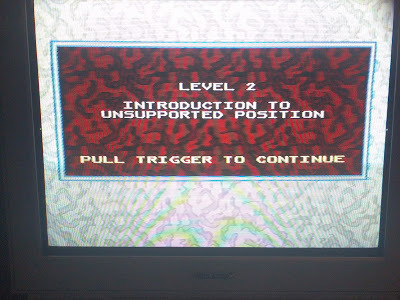 The first level is a supported position (gun balanced on something) and untimed. There are different sized targets for different distances. Large target = 50 meters, a bit smaller = 100 meters .... all the way to 300 meter distance. 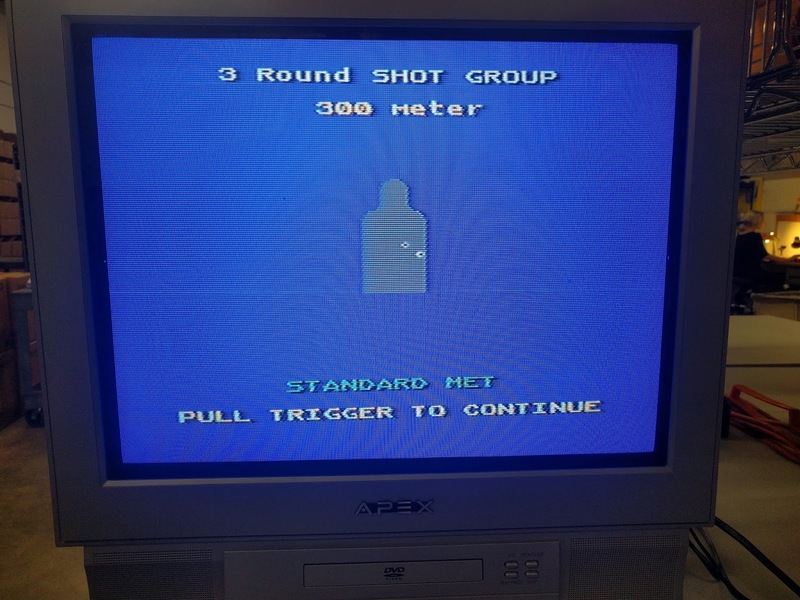 You shoot at three different targets at each range. If you hit two of them, the targets move further away. If you miss, you try again. After each shot you are told "Miss" or "Hit". Then you see a white icon moving on the screen showing where you were aiming before you shot and a matching black icon where you should have been aiming. 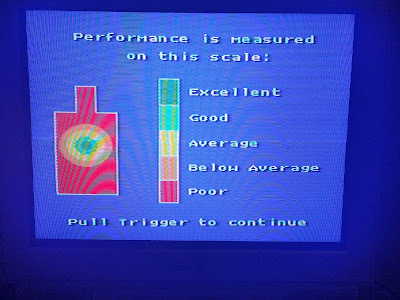 A box shows up giving you ratings on different aspects of your shot from Poor to Excellent for "steady position", "aiming", "breath control", "trigger squeeze", and "shot location". 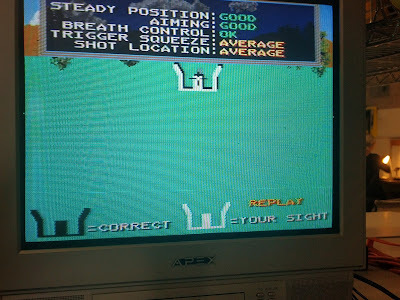 After all distances have been completed successfully you see a "shot group" screen for each distance showing exactly where your shot hit. This is an unsupported position and untimed. 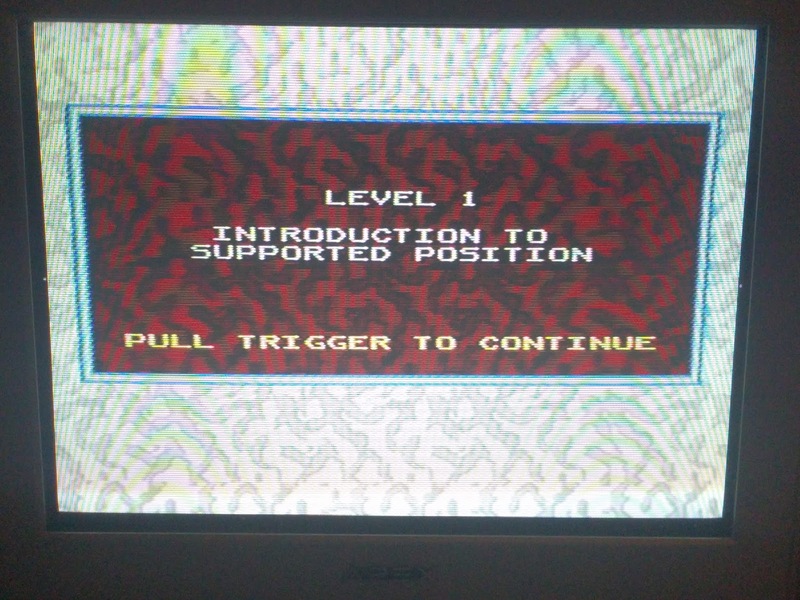 It is the exact same as Level 1 but unsupported. 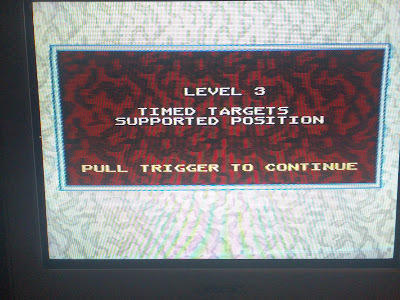 This is a supported position with timed targets. 24 targets will be presented in a random sequence (4 from each distance) and you need to hit 3 of 4 from each distance. 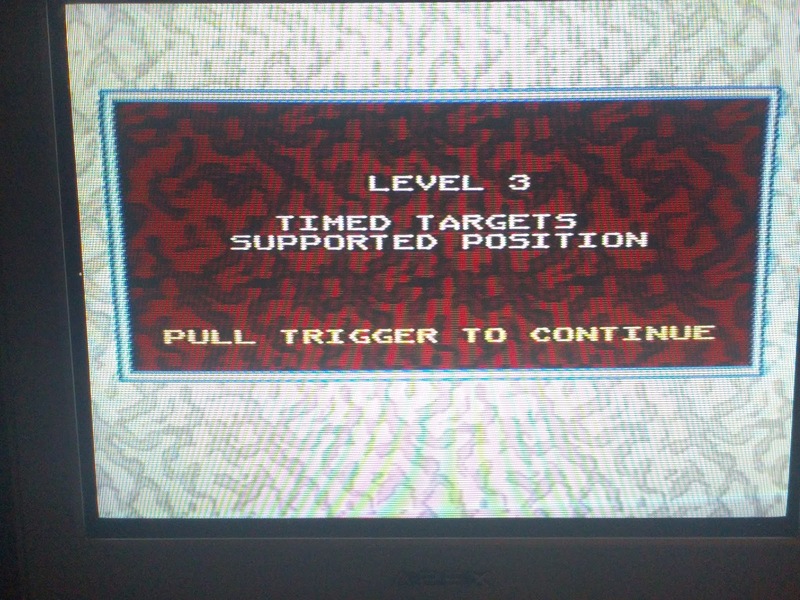 The exact same as Level 3, but unsupported position. This is where the levels start to feel more like a game than just training. Level 5 is timed and includes 20 supported and 20 unsupported targets. Targets may show up in singles or doubles and they disappear when hit and a cross hair appears on the screen showing where you shot. For the first time, you can run out of ammo if you miss too often. If two targets are presented at once, you need to shoot the closest target first or there is a penalty because it is a "tactical error" to shoot the furthest target first. You get an overall performance grade at the end too. "Expert", "Sharpshooter", "Unqualified", etc. 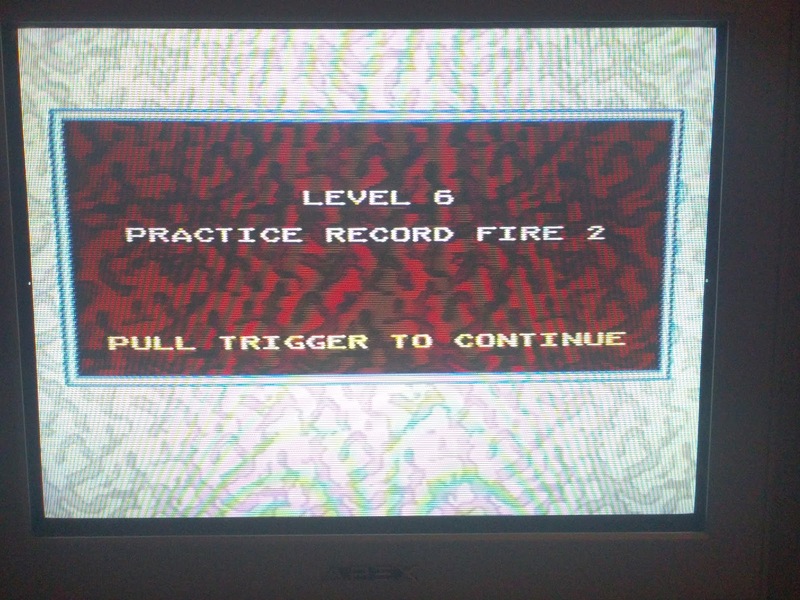 The exact same as level 5 but you only see a cross hair showing misses, not hits. Same as level 6 BUT there is less time to shoot. The time limit matches the US Army live-fire qualification course time limit. 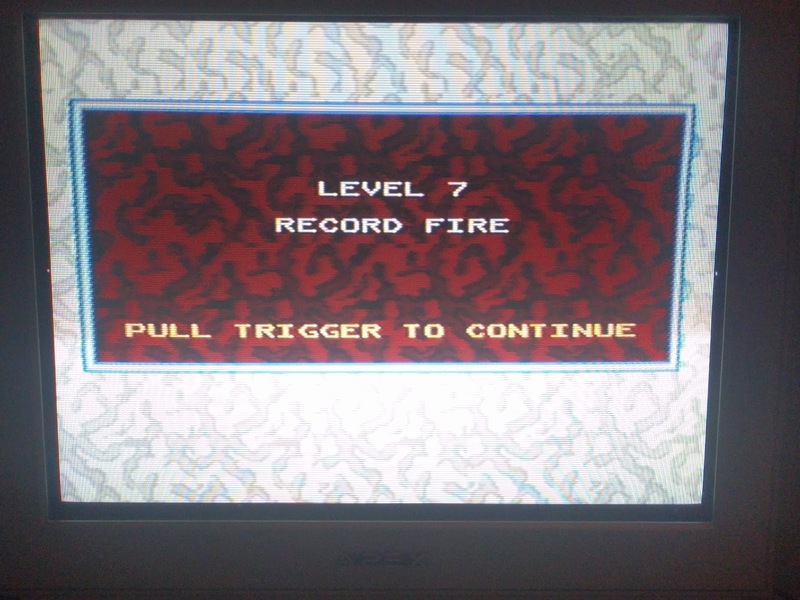 The same as level 7, but it is harder to progress to the next shot location. MACS most fun level and the most realistic. 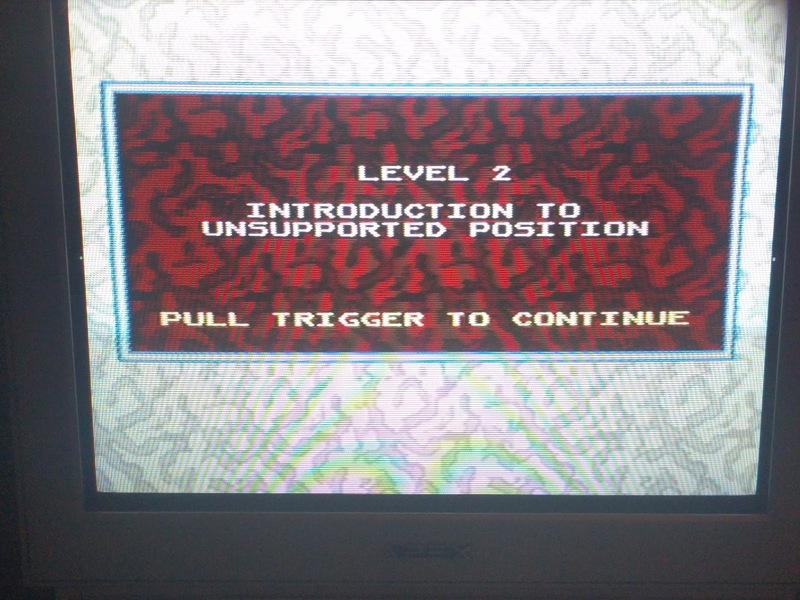 The level is timed and you use supported and unsupported positions. The targets come in 1's, 2's, and 3's and they come in attack/retreat waves. The targets all start far away and then come closer to you. Then they retreat and get further away. There are two waves of this with 40 targets each. You realize how much the gun weights about half way through this level. You definitely feel arm fatigue and back pain the first few times you do this. 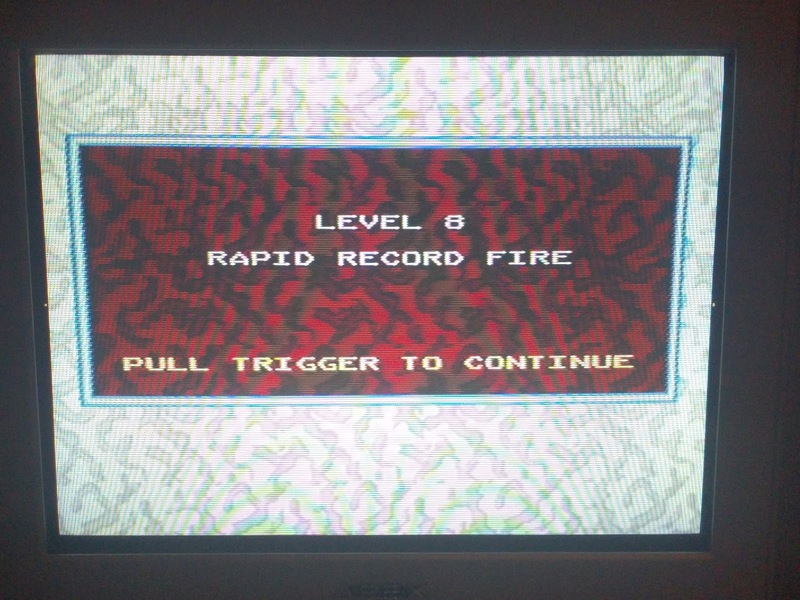 It is the only level that gets a bit of an adrenaline rush. Even though the targets are just crude blocks, it feels like the enemy is approaching and you need to fire faster before they get you. There can be three enemies at once and then you miss one and they come closer and your heart starts pumping. Then you miss more because you rush it and your heart pounds even more. 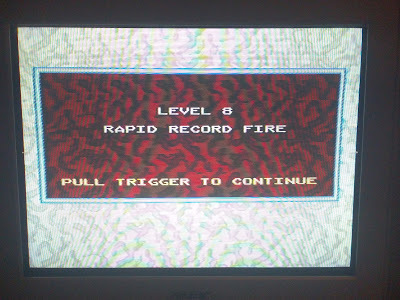 Level 9 is definitely the most fun part of the game. 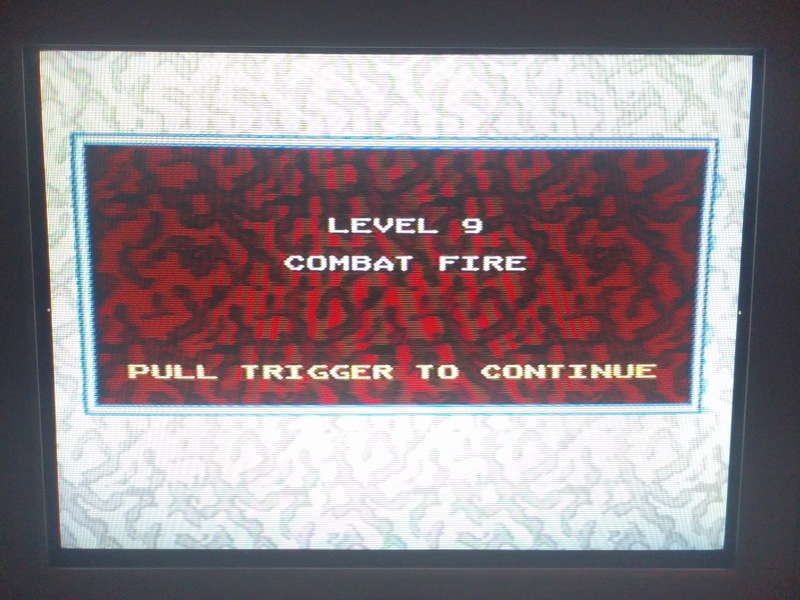 Level 9 is the only part of the game with high scores and a leader board. 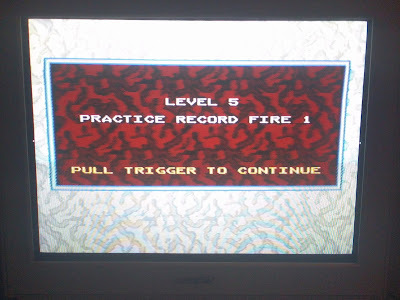 You can enter your initials and record your score until the SNES turns off. 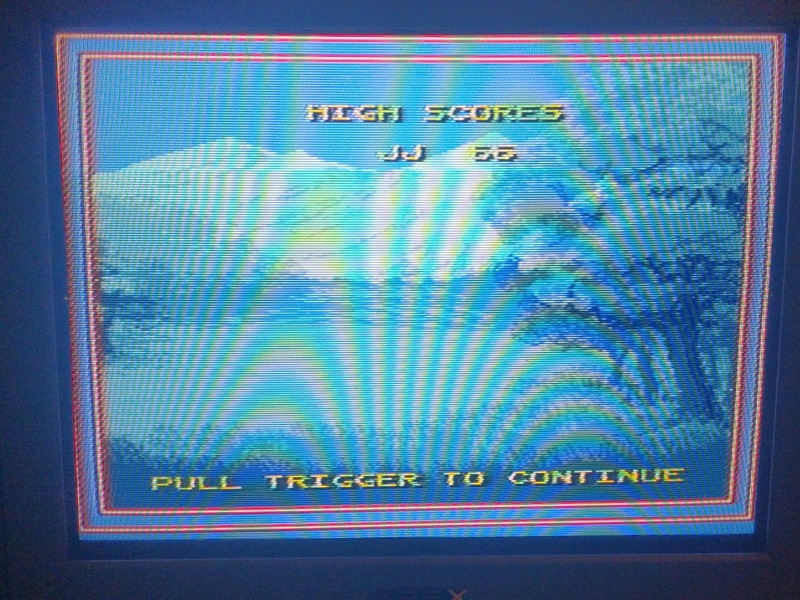 The cartridge does not have any internal memory to store the high scores. 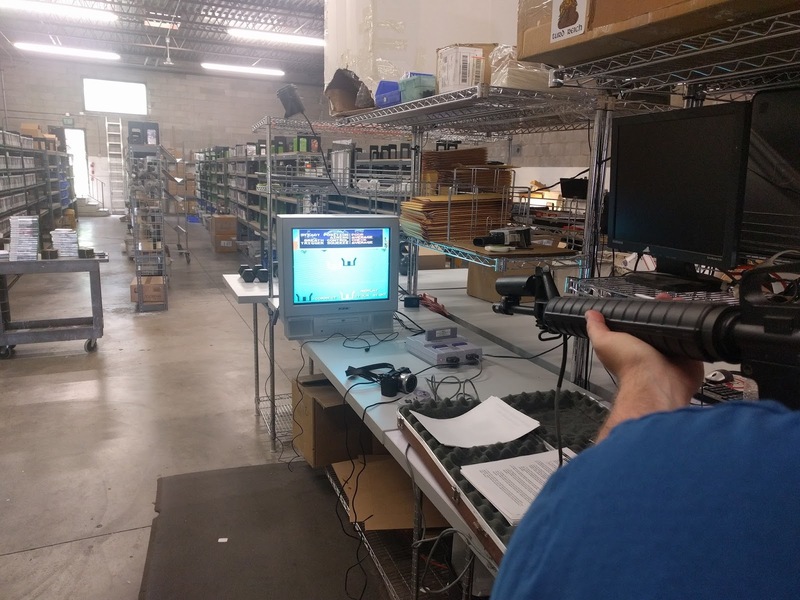 The second controller is used for game settings like level selection, wind speed, and starting the light gun calibration. 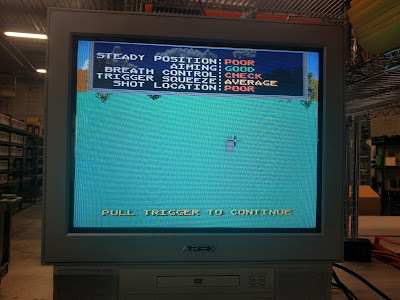 You hit "A" on the second controller at any time and it jumps to the settings page. 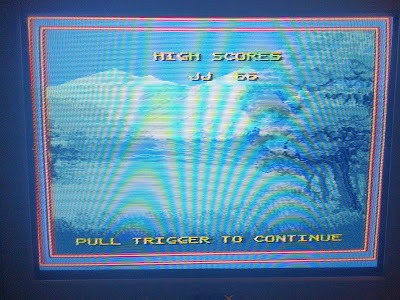 You can choose the starting level and the ending level and you can change the wind speed and direction for added difficulty. 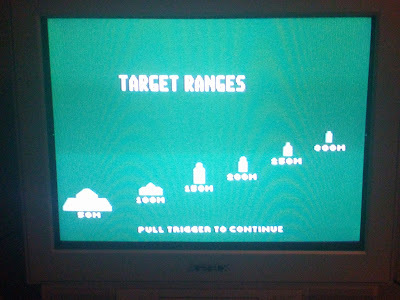 "Select" will open a light gun calibration screen. You put the MACS gun into a vice or other method to hold it steady and pointing at the target. 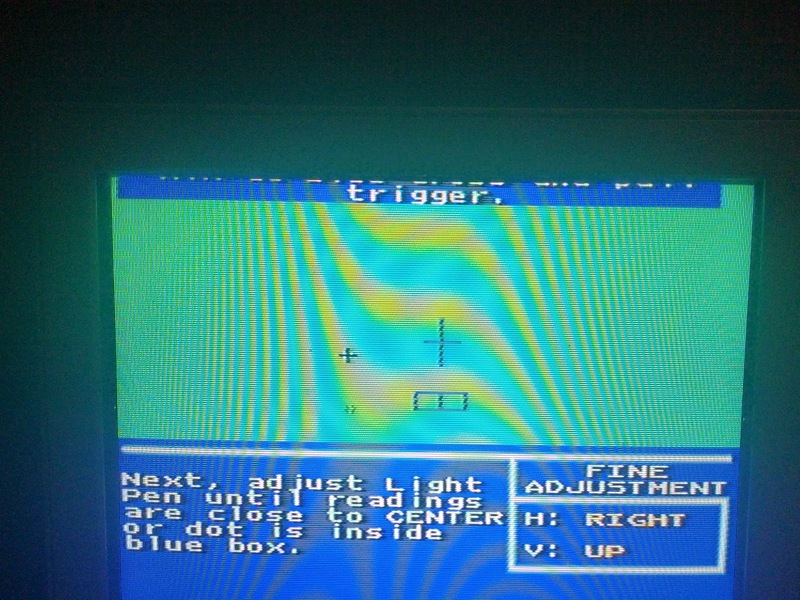 Then you adjust the light gun so the shot lines up with your expected location. The screen shows you which adjustments to make for perfect alignment. MACS is very rare. 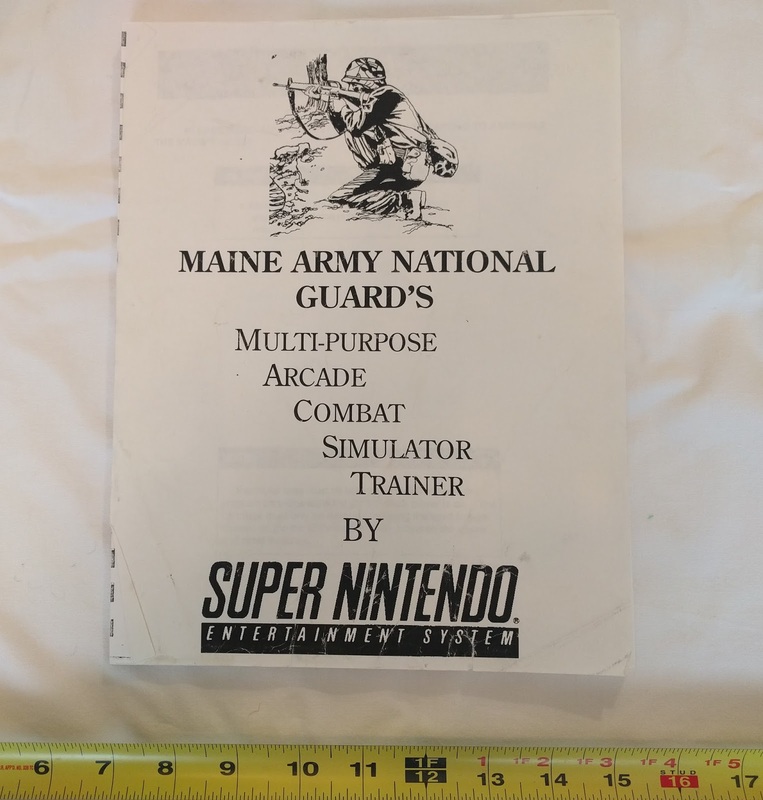 The game was only used for military training of US troops and national guard. Even if every armed forces base had 4 or 5 of them, the number created would be in the hundreds. Many of these have probably been destroyed or are stored in some army storage facility (like the Ark of the Covenant). 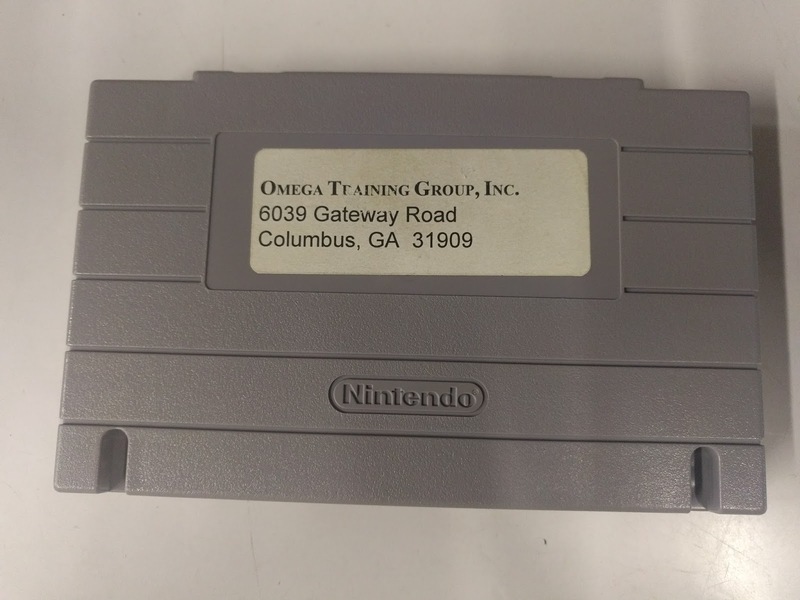 The most recent sale for cartridge by itself was for $1,500 (March 20017). The full gun, cartridge, and manual set been sold publicly so the exact value is hard to know but probably worth at least several thousand dollars. 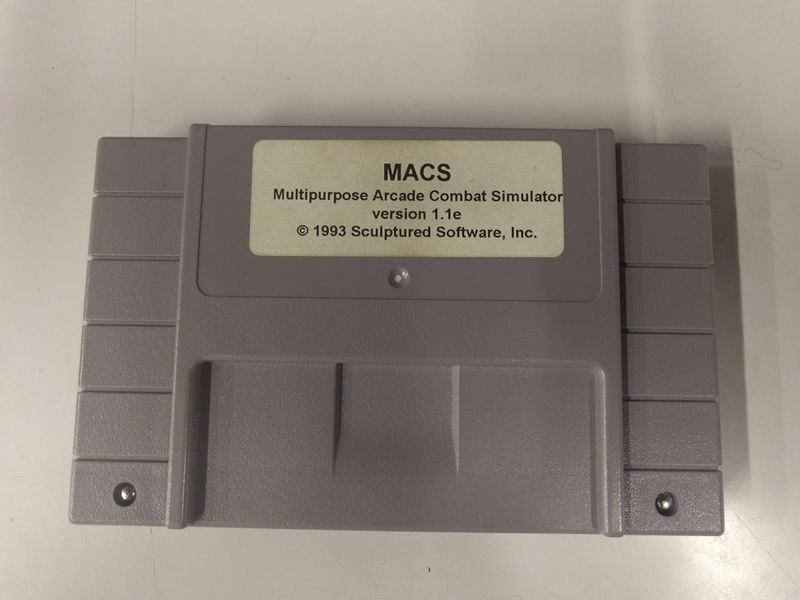 MACS is one of those games that definitely needs a manual. 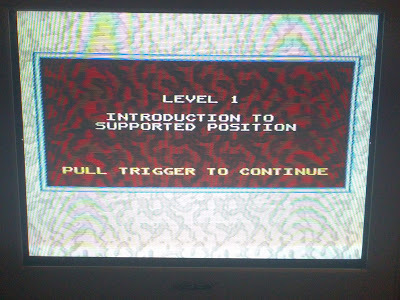 Besides "pull the trigger" there aren't very many on screen prompts to get started. The MACS manual is 45 pages of setup instructions, calibration steps, light gun adjustments, how to start the game, descriptions of each of the nine stages, and some troubleshooting tips too. Appreciate the write-up JJ, that seller didn't advertise the manual part very well. He told me he had it, just never saw pictures and I appreciate the scans. That case is pretty sweet too. Yours also appears to be an authetic Jager converted rifle, as opposed to one of the dummies. Is there a serial on it? My rifle has the serial and I have a Jager convert as well. Definitely a neat thing to own, one of my favorites besides some of the cool displays and signs. 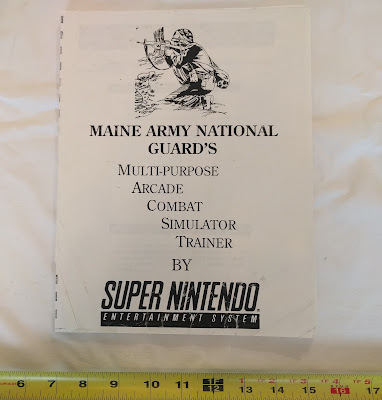 @jonebone - Yeah, I had no idea the manual was even part of the sale until I received it and asked for some help playing it. He told me to look in the back of the gun case. Very pleasant surprise. Yes, there is a serial number on the rifle. So some guns were actually a Jager at one point and then converted to light gun? Yes, some guns were authentic recomissioned Jager rifles. They have a serial like mine and yours. 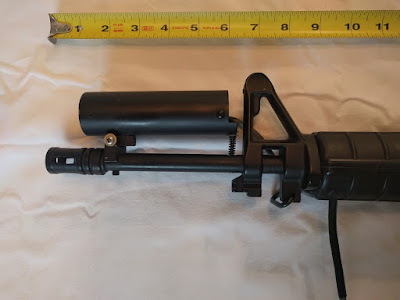 Then there were dummy rifles created that were a 1:1 replica in terms of weight and size, just obviously not an official gun when compared to the real thing. Not sure of a value or rarity difference but I assume most would want the real convert if they had a choice between the two. What does the front of the light pen look like? @anonymous - It is a circle of glass enclosed in black plastic. Does anyone know of somebody who has the rifle protion of this? 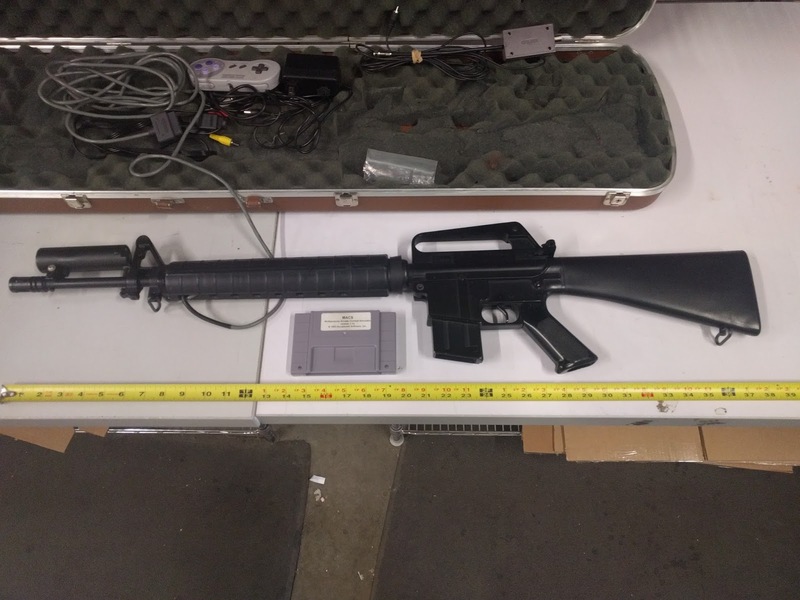 Am trying to find one as i have the original system and cartridge minus the rifle. 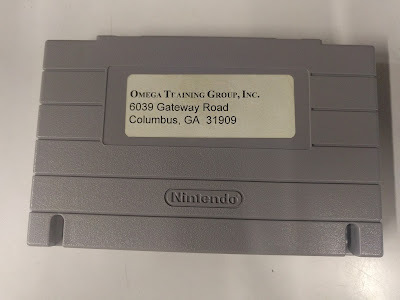 Have original game cartridge looking for the rilfe tho.. Any help?